Hello readers! I am extremely excited to be sharing an early peek at the February 2018 Girly Bits CoTM with you! So let's jump right into the post. That way you'll be able to find out how much they'll be, where you can enter to win a bottle for yourself & be a part of the whole naming process. You Look Mauvelous is a gorgeous creme based polish, that's a mauve shade, or it could even be described as a dusty lavender. Although it kind of reminds me of purple pansies, specifically because pansies have the colour gradient, as well as the pop of yellow or orange. This polish looks like a dusty purple in the bottle however once it's on the nail it's darker. There's also what looks to be dark purple flakies, as well as gorgeous metallic flakies that look orange as well as red. Like tiny bits of fire or something. They really give the polish a gorgeous glow. The stamping I did over this polish was done with the Pueen Visual Wonderland 01 stamping plate paired with BornPrettyStores silver holographic stamping polish. Dark Reflection from a dark burgundy, there's also flakie particles within, possible two different ones. From the front one looks like a yellowy green with a turquoise shift, & the other looks like a more vivid green with a dark blue shift. The burgundy colour that mainly makes the polish looks like well burgundy shimmers with hints of orange-ish gold particles. The stamping I did over this polish was done with the Pueen Visual Wonderland 01 stamping plate, there was also a gradient done with Girly Bits Emerald Green as well as Hit the Bottle Chartreuse on the Loose. They'll be available on the Girly Bits Cosmetics website, you'll be able to find them on the Colour of the Month series page. These two polishes are available from February 1st, till February 28th. They'll be available for $16.50 each individually, or you can get them as a set for $33.00. If you chose to get both items I recommend getting them within the first 10 days, & you'll be getting them at a discounted price. The early bird special is available from the 1st to the 10th of each month, it takes $2.00 off of the duo price which brings them down to $31.00 each. 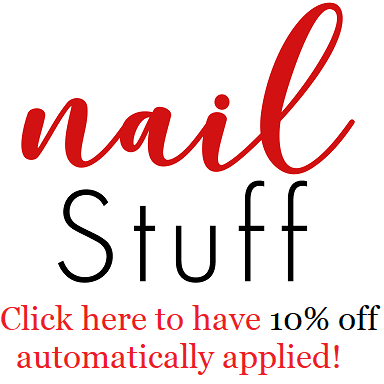 Naming thread & giveaway post: Once a month in the Girly Bits Polish Lovers group, usually on the 20th of the month there'll be a naming thread posted, allowing fans & customers to name the CoTM polishes. If the name you suggest wins, you'll will the polish you've named! Both are really nice, but the purple one is my favorite.